52 in 52 – Design 53 BONUS! Okay, so I couldn’t resist. When I posted designs 49 and 50 last week, I received a note from Kevin Dowling (of CK fame), who also has an old South Bend lathe. He made a comment about a technique called “cloudy day” lighting, where shadows and highlights are removed in a viewing chamber for seeing detail on specular materials. The concept was that this might work as an aide for reading drill bits, which often have very small letters, laser etched on the cylindrical surface. I was intrigued, so created this small gadget. This is a small chamber with concealed LEDs (Cree XRE’s) at the sides behind shields. The interior is lined with White Optics material to produce indirect light around the subject. 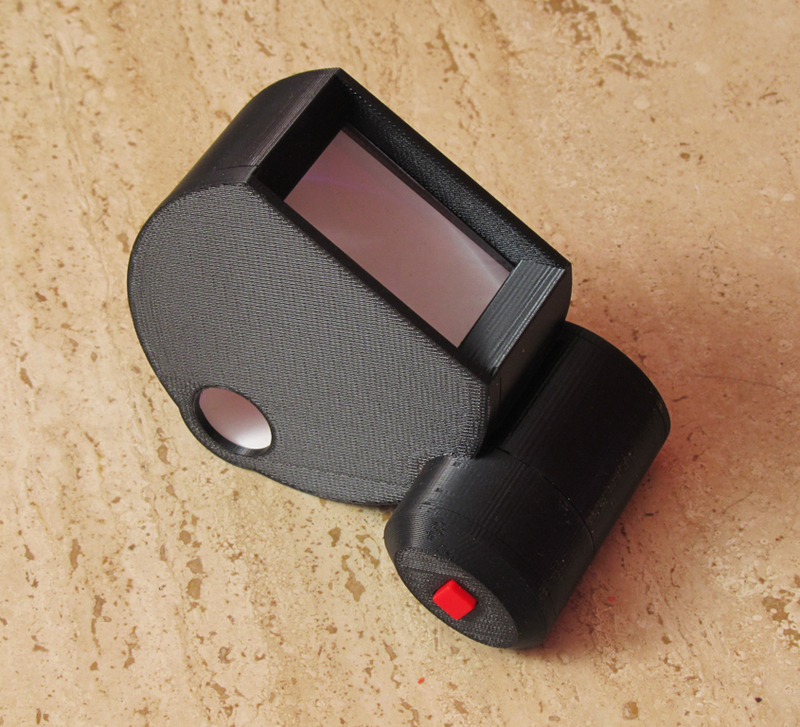 It is powered by a 9V battery, with a simple momentary pushbutton switch. 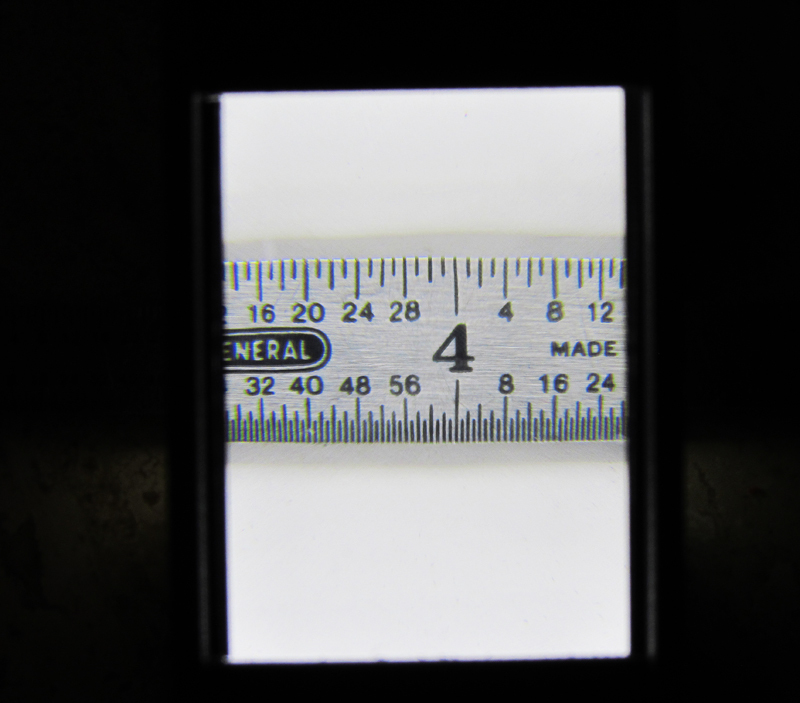 It will accept objects up to 3/4″ in diameter. To enhance vision I have added a 1.5X lens at the view window. The combination of bright indirect light and optical enlargement makes reading small drill bits, mill tools, and markings on the side of thin wires significantly easier. I have also found it works very well in viewing the condition of lathe cutting tools, which often look and feel sharp, but aren’t. Looking at them in this viewer reveals flaws impossible to see otherwise. This can also be used to thread needles, read a thermometer of a sick kid, and other surfaces that will fit through the port. 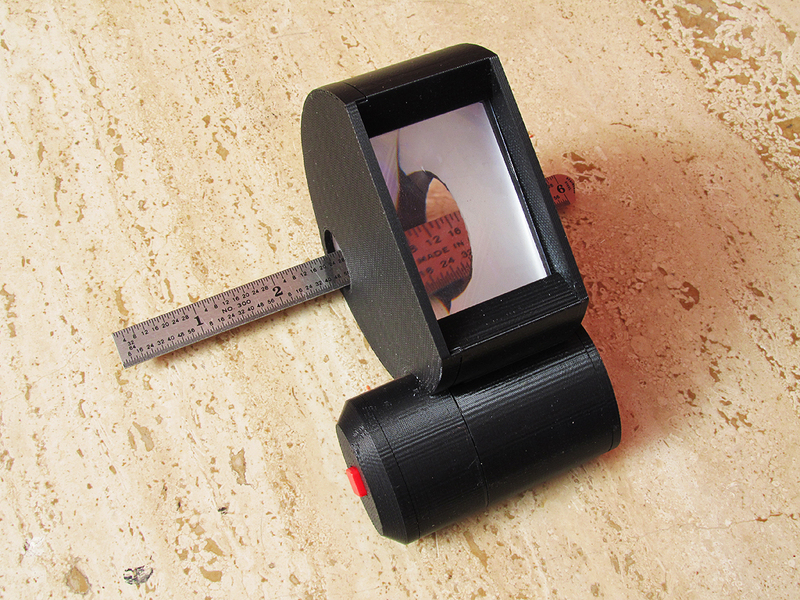 While this is not a perfect cloudy day viewing system, as it does not completely eliminate the dark stripe one sees on cylindrical surfaces due to the opening window, the fault is minor, and does not detract from the significant improvement it offers overall. It also costs a LOT less. This can also be seen at Lumenique 52 in 52 – D53 for those interested. 52 in 52 – Design 52 Complete! Well, here we are at the end of the year, the last days of the last week. 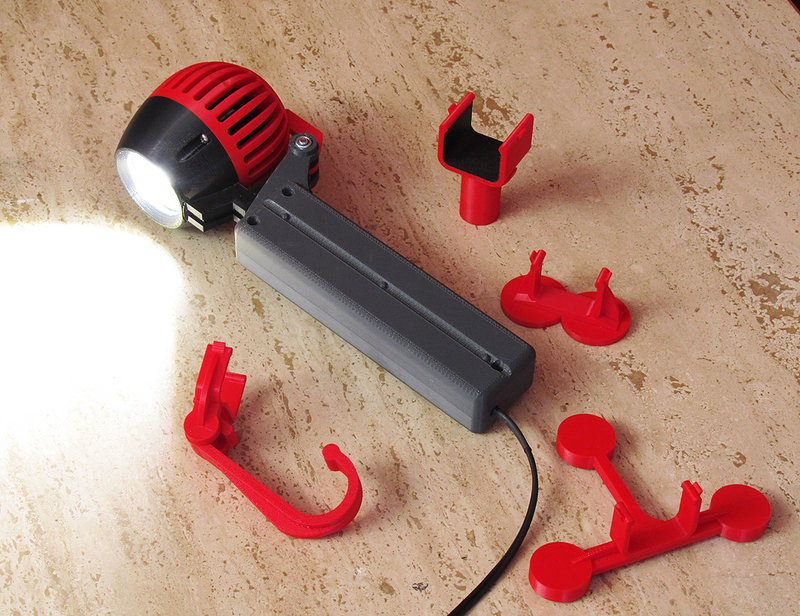 Design 52 is the official conclusion of the 2010 challenge, and is another task and work light. This design is a work in process I have been toying with all year in use of color and white LEDs to produce color and white light, using simple controls. 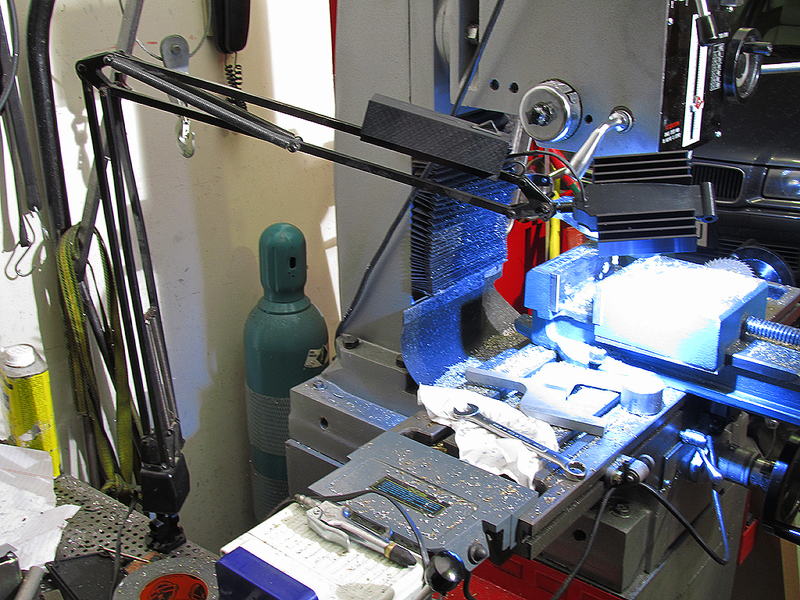 The first effort has been in finding the right mix of LEDs to produce the best result. This represents one version I have found works very well – specifically the GE Vio 830 white LED with two Lamina RGB Atlas light engines. This produces a wide range of white values with CRI greater than 80, and as high as 92. 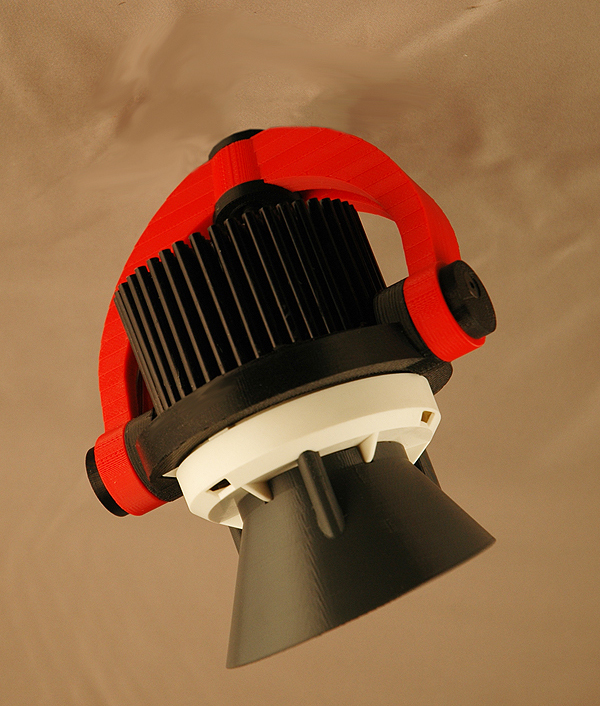 The light head includes an optical mixing chamber lined with White Optics material and a fine prismatic diffuser lens. Thermal management is through the use of a Nuventix Synjet PAR20 cooler/heatsink, allowing the LEDs to be run up to the total of 24 watts without an issue of over heating. 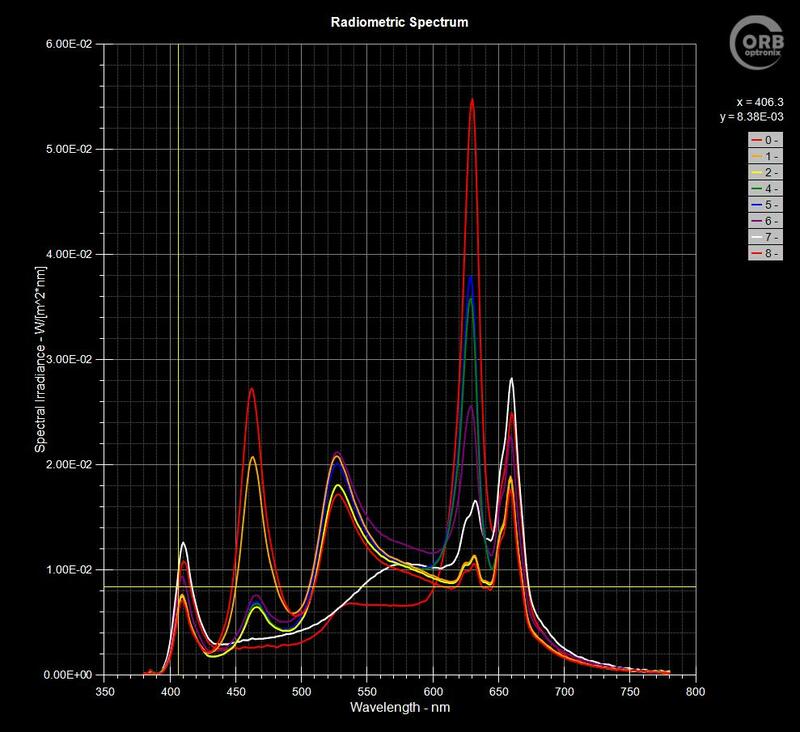 You can find several images of this at Lumenique 52 in 52 – D52, as well as spectrum summary, chroma chart, and a table showing a sample range of CCT and CRI results captured from this light in operation. The challenge so far has been LED selection, the next is driver design. This design is a step forward in that it is designed to use the Verde Designs 4 channel programmable current driver package. This driver can be controlled with 0-5V, 0-10V, and DMX, which will facilitate incorporation of a controls system that will add greater fidelity to color selection, as well as eventually including a feedback loop to make corrections as things heat and cool during operation. So who cars about color in task lighting? Well, the inspiration came when working on a wiring harness for a motorcycle project. Their were more than 40 color combinations in the harness, including stripes and solids. Some of these combinations were giving me fits. For example, the faded old black wires, brown wires, and dark purple wires all looked the same to me. As an experiment, I threw together a simple RGB light and pointed it at the harness. With a little fussing around, I found a color combination that made the wire colors jump, no more mixed wires. Since then, I have found instances where adjusting the CCT of white, or amplifying one color or another came in very handy for either matching colors, seeing color, or simply improving task visibility. This has led to the product you see here. I also have a theory that for men with color blindness, the ability to either amp up or tune out green and/or red balance in light will be useful in aiding differentiation of reds and greens in tasks where this is important – like electronic wiring, or other color tasks where red and green differentiation is difficult, but important to performance. So, this is the conclusion of 52 in 52. It’s been quite a year. The project did what I had hoped in getting me deeper into the technology, while enforcing constant state of design exploration. While I do not plan to attempt to repeat this in 2011, there will be new designs presented here, so please drop in and take a look now and again. Thanks to everyone who has been following along and offering support and encouragement. 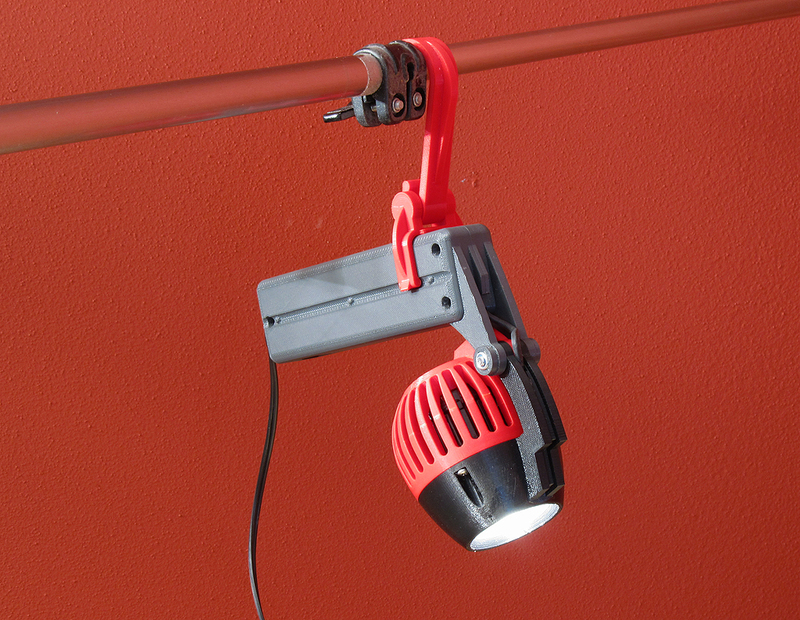 For the most part, LED work lights on the market today are useless, low grade junk. While there are one or two (literally) fair performing products, none actually replace halogen or CFL lights at all. In fact, the good old incandescent/metal cage shop light can kick the latest tecnologies tails any time. The drawbacks of a scalding hot lamp and metal shroud, lamps that pop at the slightest banging about, and the lack of any directional control are big liabilities for that old incandescent. The fluorescent lamps are not that durable either, with any rough handling resulting in a popped lamp, while start up in cold temps is sloooooooow, or not at all. Color is also pretty sad, making identification of color coded wires under a dash a bit challenging. Optically, the fluorescent stuff just blows light everywhere, often right in your eyes when your working too near one of them, with no way to control it. The LED crap on the market is poor in light output and harsh with their multiple light sources, also of really poor color. They are essentially bad copies of cheap CFL twin tube junk. The only thing to say good about them is they are pretty cheap, and won’t burn your face when lying next to one under a car or in a foot-well. 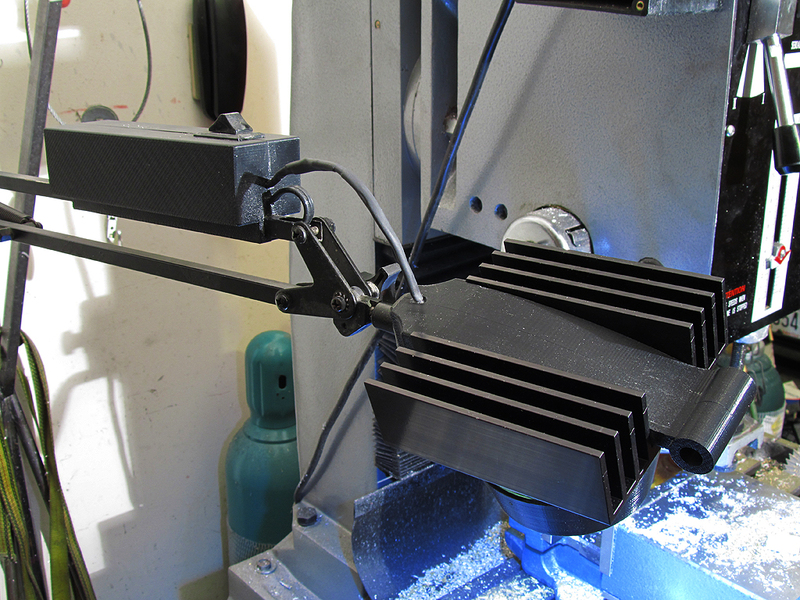 Design 51 is a work in process effort intending to create a real LED based shop light that can kick the incandescent and fluorescent products out of the tool box, and put the LED stuff from the catalogs to shame. I started with the LED, in this example using a 1200lm Bridgelux LED. I applied a Lidel 50 degree optic to this. 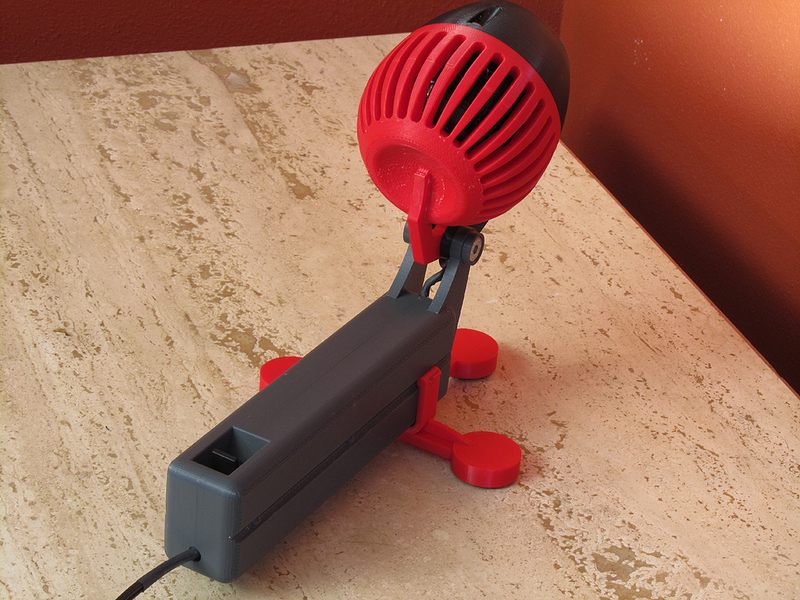 In all, at full operating temp, the light head produces over 911 lumens, with a CBCP of 1300. 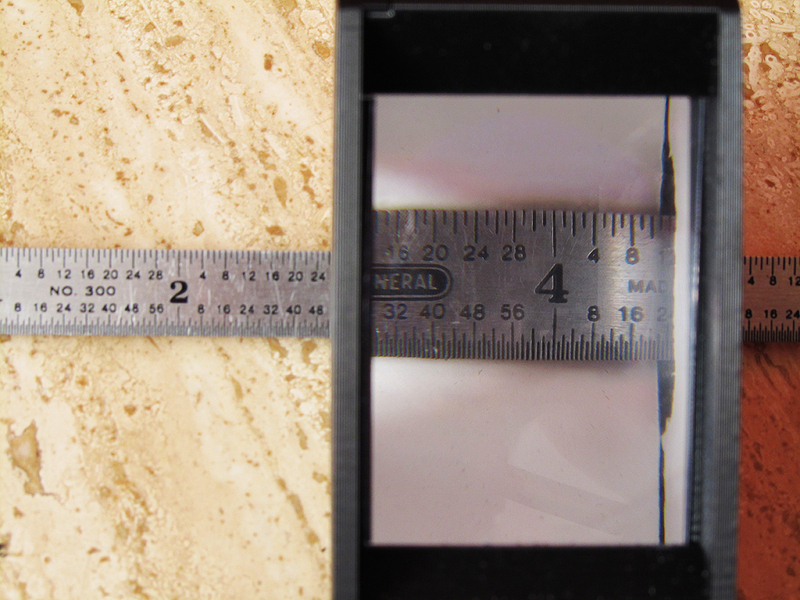 That’s enough power to put 134 footcandles at the center of a worksurface 36″ away, over an area of 72″ in diameter. It also delivers over 1400Fc at 12″, so there is a hi-lo setting to the power switch, to trim light on close up tasks. Next, since the LED operates at roughly 20 Watts, thermal management was an issue without making the head the size too large to be useful. Not only that, but shop lights tend to be used in a wide range of positions, and in various ambient temeratures. To address all of this, I used a Nuventix Synjet active cooling system. 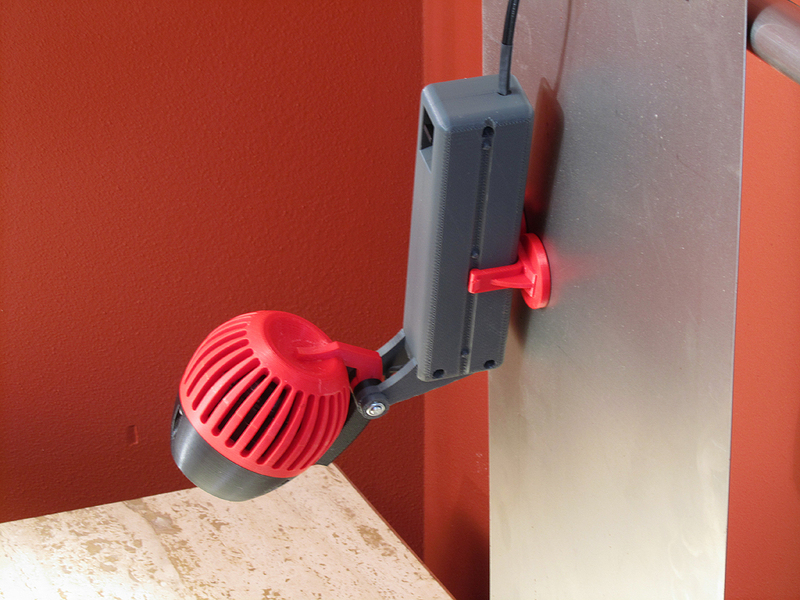 This little gadget generates moving air over a small heat sink to significantly reduce package size and thermal controllability. In this case, after operating for over 4 hours steady in the high mode, the LED never saw more than 70C, and the outer surface of the light head remains cool to the touch. With a head in hand, I incorporated the LED driver and the Synjet power supply in the main body. Ideally this will be a single electronic assembly, but for this version, its a combination of parts. I also used a remote 24VDC power supply so the cord presents not potential shock hazard, and can be made from very flexible, fire retardant materials. The mounting attachments snap onto the main body, and provide a hook, a magnet base, a floor stand/stabilizer, and a 5/8″ tripod mount for mounting to any lightweight tripod stand. The head itself tilts a fill 270 degrees, so aiming can be made as precise as one might need. I’m going to fool with mounting gadgets as I put this to use in my own shop. While this is by no means perfect, or economical, it is infinitely more powerful and useful as a professional tool. Something I cannot say for the rest of the LED stuff I have tested and have on hand. I need light more than I need to save a few dollars. 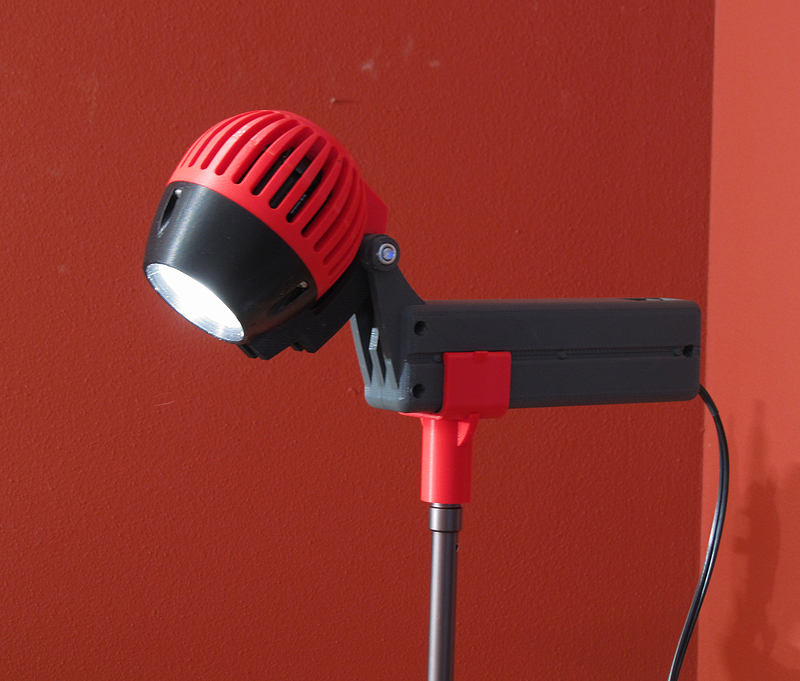 I think D51 delivers not only usable light, but new value not available in other work lights of any source. 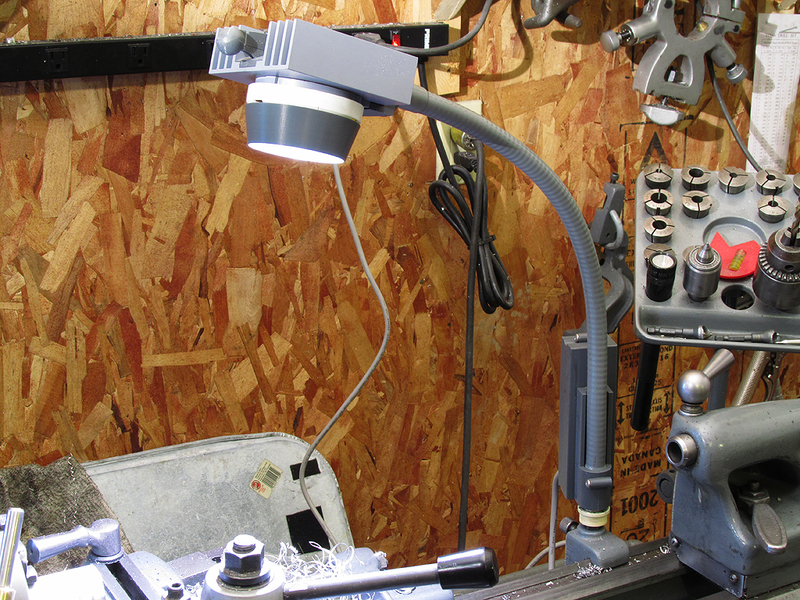 While the task light for lathe work (D49) is somewhat limited in its flexibility in head location, for mill machine work, and a task light that can serve for both machine light and adjacent welding table, I needed more movement. 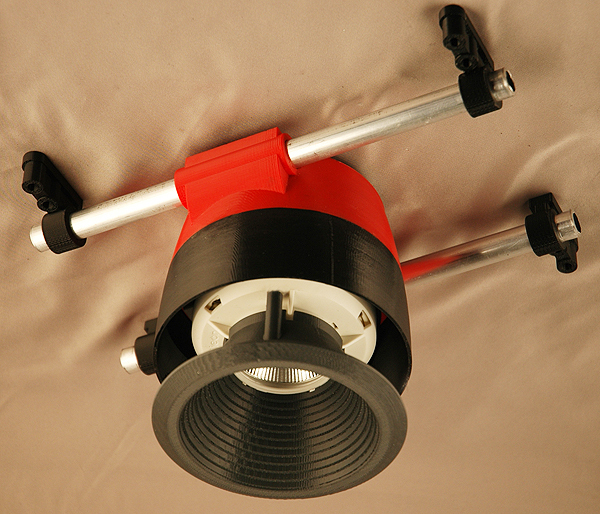 In this design I recruited the arm component from a high end drafting light that once held a quartz halogen head that had burned me and gave me sunburns on more than a few occasions – so found itself on a shelf in the basement. 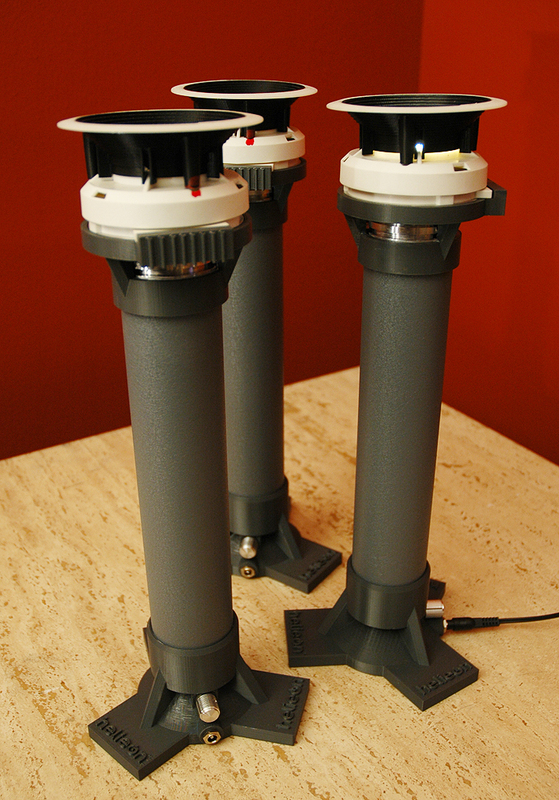 The parallel arm configuration and swivels/tilts at the base and head allows me to put light whever I need it. 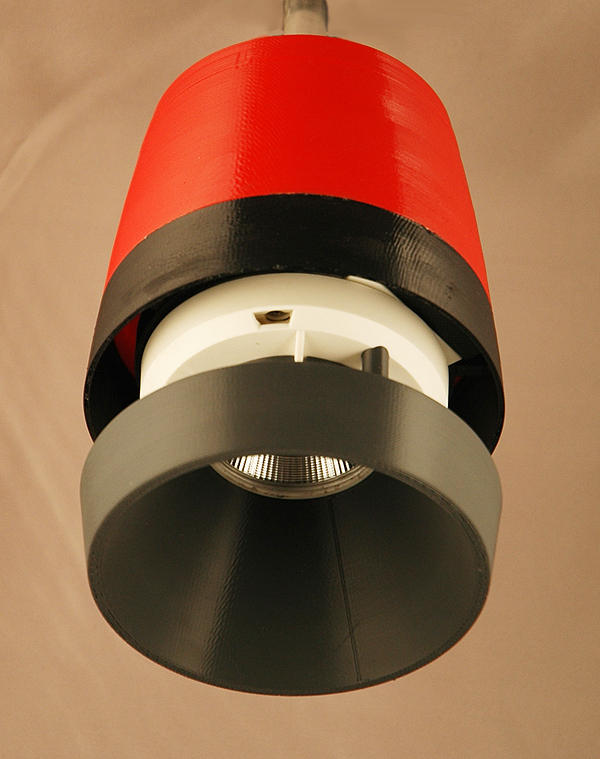 The head, like D49, uses the Helieon module with customized optics. Note that in both this and in D49, I prefer a single light source over lumps of multiple LEDs. In very tight task work, the light source is often brought down very close in. Multiple LEDs present too much noise in terms of multiple shadows and dots reflected on surfaces to be tolerable. I like a single, large area bright source, as this is easily recognized by the eye, and softens the shadow edges as the light source scale, even when located near reflective tasks. Another problem addressed here is the potential for killing electronics. Since the welding table is the ground plane for a TiG and MiG welder, I insulated the arm of the task light from the table, and located the driver package at the top of the arm, as far away from any potential EMI as it can get. Of course, there are going to be instances where the light is located near the welding action, so there is a ground wire in the cord connected to the arm, which should help. However, only time will tell of this strategy will work long term, which is why this lamp was put in service right away… today… as soon as it was completed. And, yes, the shop is a total mess right now. Between closing the 52 in 52 project, trying to get a motorcycle project prepared for dismantling and paint, repairing a crashed Corvette, and the generally frigid weather coming down on us like a pile of ice blocks… I just got behind on the tidiness thing… something that will be resolved very soon, as I’m sick of looking for tools and stuff buried in the mess. Back when many things were made here in the States, so were the tools we used. Today machinist/hobbiests and small custom shops have come to revere some of the most iconic of these tools. In lathes, South Bend holds a special place in history (the company has longs since died and become a brand for import stuff). These machines occupied machine shops, went to war, and schools. The one in this picture is a 10″ x 42″ tool room lathe. It has all the good stuff of the day, from taper attachment to driven cross slide. 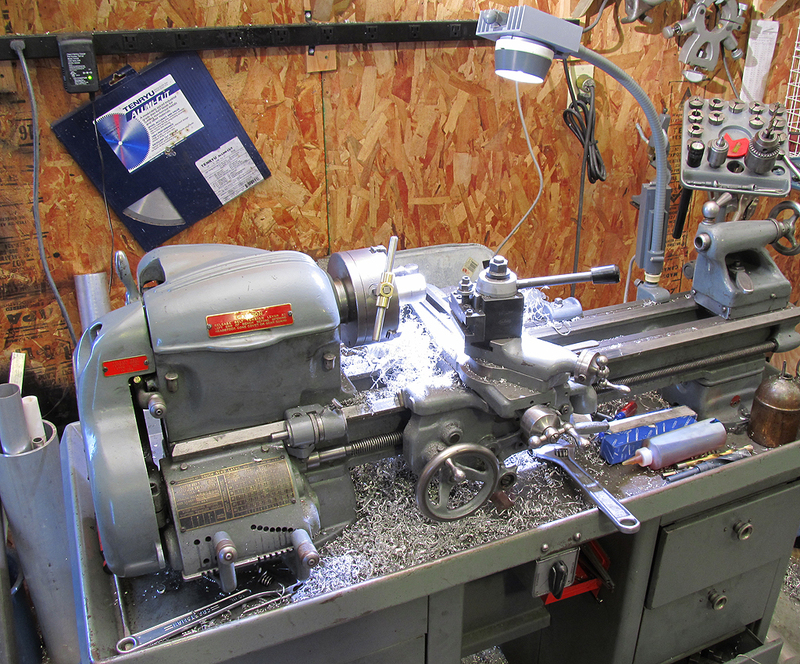 For me, restoring this lathe and putting it to service in our prototype shop is like restoring a classic car. There is a great deal of timelessness about this tool, and they are as tough as they come. This particular model was purchased in the 1960’s, and was worked hard for its entire life. 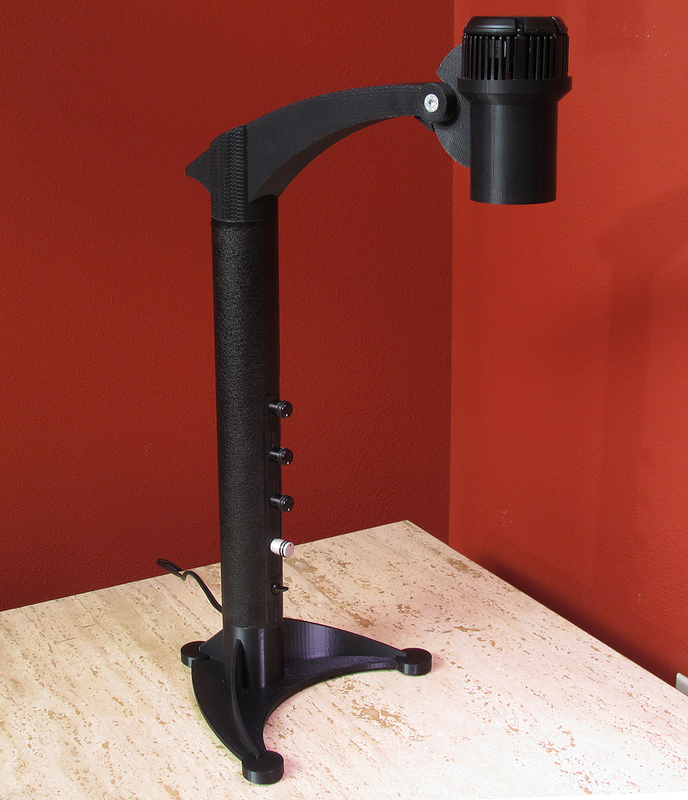 I rebuilt it in 2009, and have just updated the task light with the design you see here. LEDs with high performance DC drivers make excellent machine task lights. With no flicker, there is no strobe effect, and with LEDs not minding a little vibration and getting banged around a little, the issues of burned out incandescent lamps is ended. CFL retrofit lamps in this application are awful. They take too long to warm up, most flicker when lighting moving objects, and the beam intensity is miserable. Halogen is not a lot better than incandescent, and is hot. 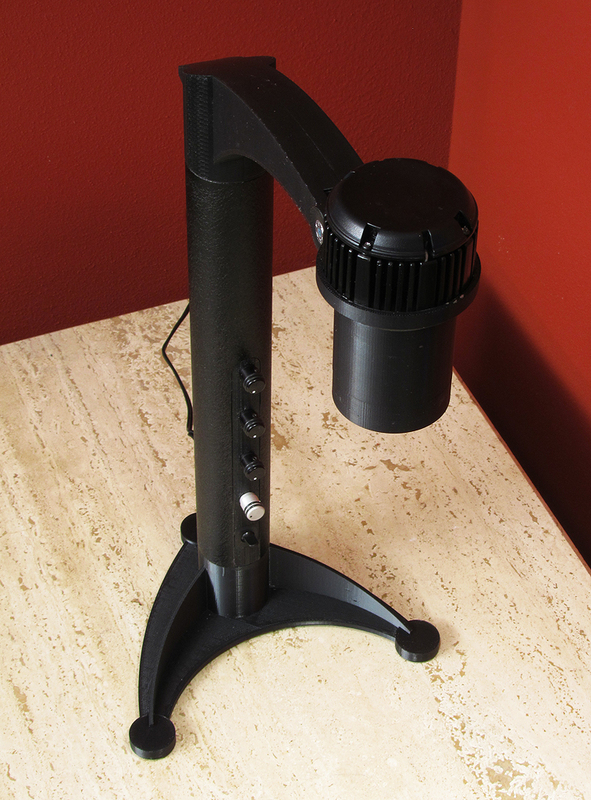 The rework essentially replaced everything on the work light except the flexible stem and mount to the lather bed. I used a Molex/Bridgelux Helieon module and a 1A driver mounted at the base. The replaceable module allows me to change the light distribution by snapping in different modules. For example, when doing long taper work, a wider overall light pattern is great. But when working on small detail work, a spot distribution is better. With a couple modules in the drawer, this is just a quick swap. DESIGN 44 - The Helieon module display used at Light+Build by Molex. Includes one module in the three light distributions and placed the modules at a height that was comfortable for viewing and playing with the modules themselves. DESIGN 45 - This accent light not only displayed the modules in a practical application, they were the primary source of lighting in the Molex Lightfair display, lighting the floor as well as graphics walls. 24 of these were made, with a few used a little later at ArchLED10. 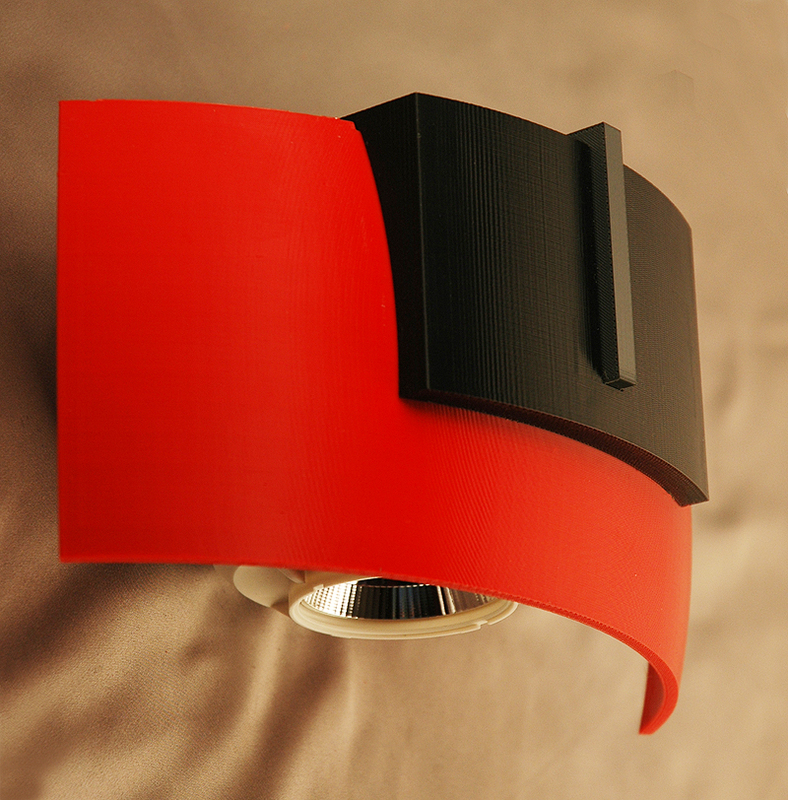 DESIGN 46 - 4 of these sconces were used on a wall display and to light a work table at one side of the display. DESIGN 47 - 6 of these pendants were used to light the center floor area of the display and show the module within the context of a pendant envelope. DESIGN 48 - 6 of these downlights with spot optics were used from a height of over 10 feet, to provide floor accent lighting in the display. 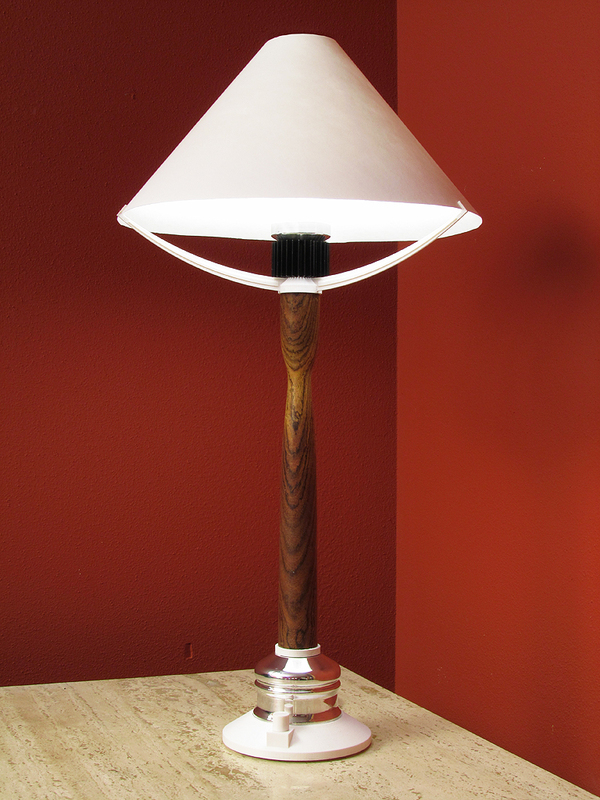 How about a table lamp without the “lamp”. I’m not talking about LED retrofits made to look like incandescent lamps, or those offensive screw shaped CFLs with the lump of plastic on the base. I am talking about tossing all of that and concealing the light source altogether, allowing the shade to produce a soft indirect light. No glare, no heat, and energy efficiency all rolled into one. This design utilizes a 7.2W GE Vio LED, operated at 350mA, with an integral dimmer in the base. The LED is hidden in the cup at the top of the stem, over the heat sink. Yes, the heat sink could have been hidden completely as well, but for this exercise I liked the way it looked, so left it exposed. 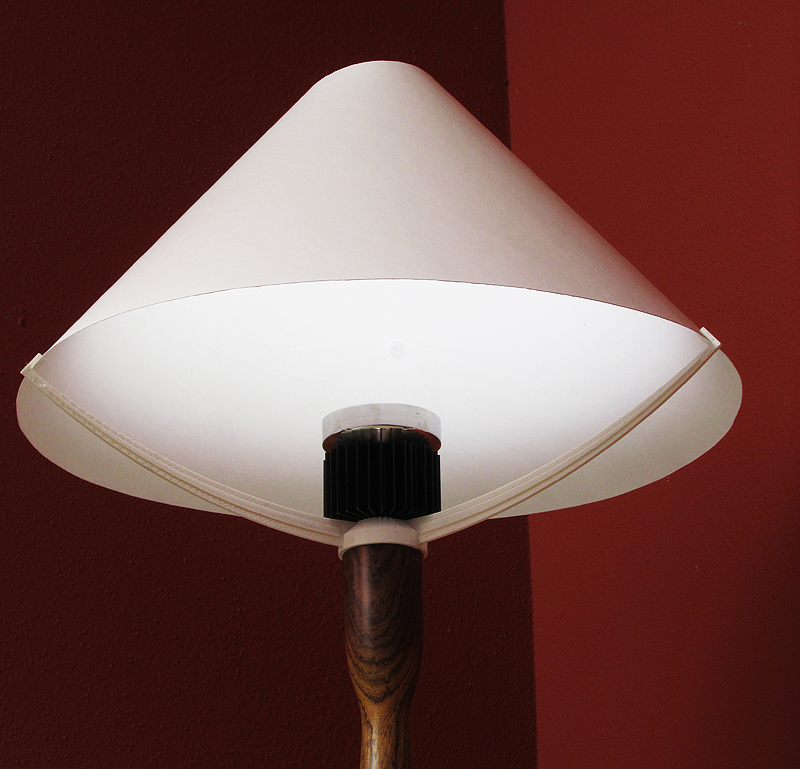 The shade is a simple paper shade made from White Optics material to demonstrate how effective a shade can be with the right reflective material in use. The main body of this particular design is English Walnut, with polished aluminum and white accents.